"The Sonny & Cher Show"
The look on Sonny's face when he finds out he's been 'replaced...', priceless...! Save 10% on your booking today by mentioning promo code SPRING! Want that hair-swingin' Cher at your next event? Get her plus a whole lot more by booking That 70's Cher Show today! Suzanne's one-woman custom shows are the ultimate all-around variety acts for any venue & she's got a show to fit every budget. The clever mixture of comedy & costumes along with spot-on vocals makes for truly unique & entertaining custom track shows. She specializes in the impressions of other female artists, too, including Karen Carpenter, Anne Murray, Nancy Sinatra, Stevie Nicks & others. You're in for a treat when you book this comedic chameleon & your audience will love her! She's fab, fun & affordable! Suzanne was super fantastic. She performed for Grandma's 80 th birthday party and totally entertained us all including the babies, kids, and adults as well. She wasn't hindered from the small area we gave her to work in. She was a trooper and gave us the best show!! She couldn't have been any nicer and super easy to work with. I highly recommend her! Suzanne was GREAT!! 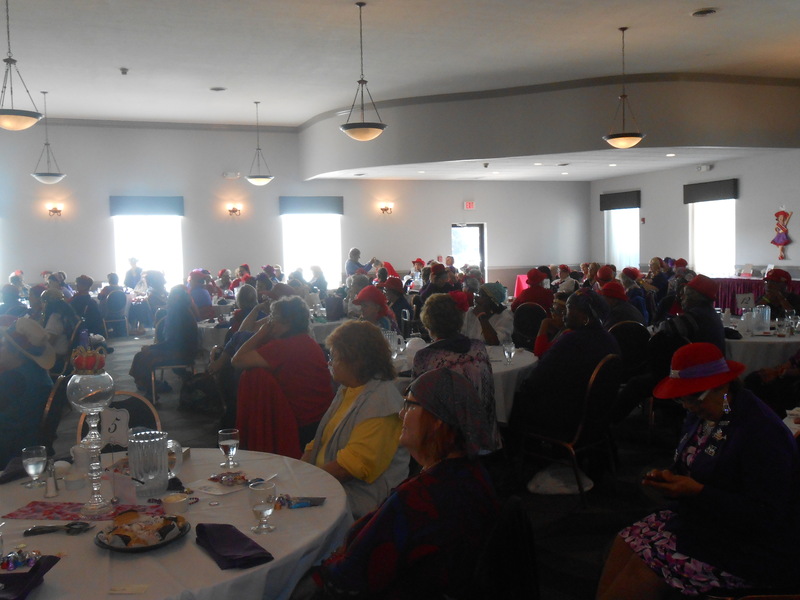 The Red Hat Ladies loved her and her show. She was a Doll in every sense of the word. Wonderful voice. I am so glad I booked her. 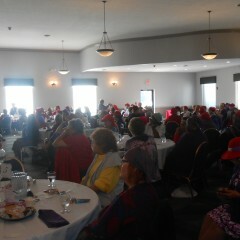 This was one of the best shows we ever had for our Woman's Club. Suzanne's personality, energy and audience appeal makes this show an exciting and entertaining expirience. She is so talented and has mastered keeping Little Sonny in line! Her voice is so lovely as she sings the songs that bring back so many memories and she even had many of us dancing to the sounds of the 70's. We love her, we love Little Sonny, we love the show, and can't wait to get her back! She is a fantastic performer .....grace, beauty, style, talent....all in one! Suzanne always was a part of our shows ..Her appearance,voice,stage presence is phenomenal..
A sweetly entertaining variety show! Elegant costuming, friendly rapport with the audience, good improv skills, and funny comedy routines - all integrated seamlessly into her show. This is a fun solo show with an effervescent presentation of classic pop material, plus Suzanne's great singing impressions. Not to be missed. 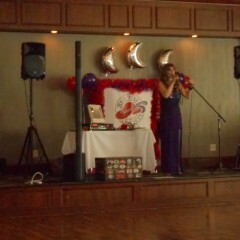 An Excellent Entertainer and Vocalist!! I have worked with and worked for Suzanne at Mountaineer and Presque Isle Downs Casinos, Fund Raisers, Clubs, Festivals and other venues. She is an excellent entertainer and vocalist, who can sound like several different artists. She is a class act,a true professional, a pleasure to work with, and I highly recommend her. I guarantee you and your audience will be truly and thoroughly entertained!! 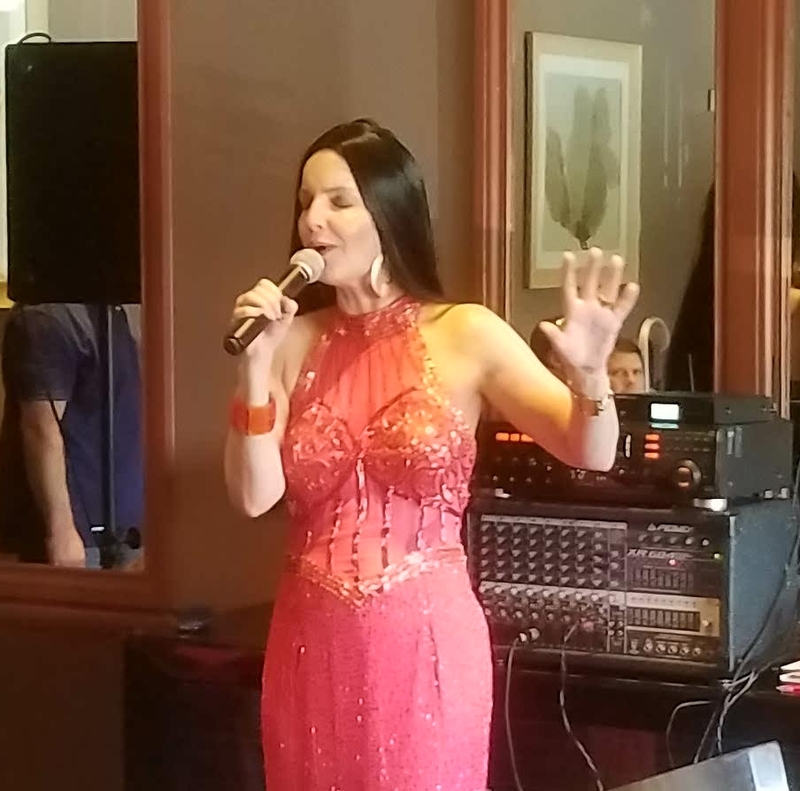 When you book Suzanne, you can expect a highly professional and classy performer who will go above and beyond to make your special event one to remember. She also offers you six different shows to choose from. 'That 70's Cher Show!' 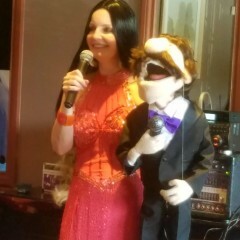 This short 20 to 30 minute show is great for the surprise birthday party, wedding reception or anywhere you need the 'groovy' looking Cher. Suzanne performs the diva's major hits and throws in a lot of barbs and hair swingin.' A 'spoofy' bit that's fun for everyone! 'Cher & Friends Variety Show.' Suzanne begins her 45 to 70 minute performance by taking the stage in a beautiful gown donned in a gorgeous long wig. She opens with an upbeat song and then explains to the audience that she will be doing a few of her favorite singing impressions. Suzanne might begin with Karen Carpenter then move on to some great female artists such as Wynonna, Stevie Nicks, Anne Murray, Nancy Sinatra, Crystal Gayle, Pink & disco queen Alicia Bridges, for example. She also sprinkles in some tunes from genres like Motown and even big band if you like. She includes props like go-go boots, jackets, jewelry, hats and tambourines, etc. Approximately 15 or 20 minutes before the show ends, Suzanne makes a quick WIG change right in front of the audience into the Cher wig! 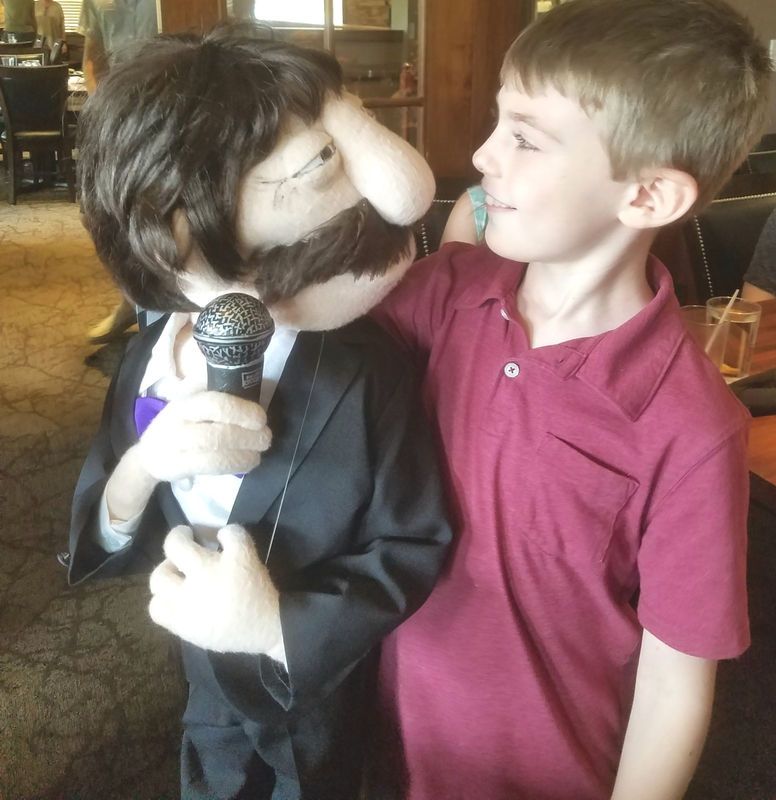 She also brings as surprise, a custom-made, 3 foot-high Sonny Bono puppet to bring the totally hilarious 'duo' aspect to life. The combination of comedy, singing, audience participation & special props makes for a totally entertaining show that is perfect for private or corporate events, senior community facilities, casinos, halls, small theaters, festivals, nursing homes, country clubs and resorts. 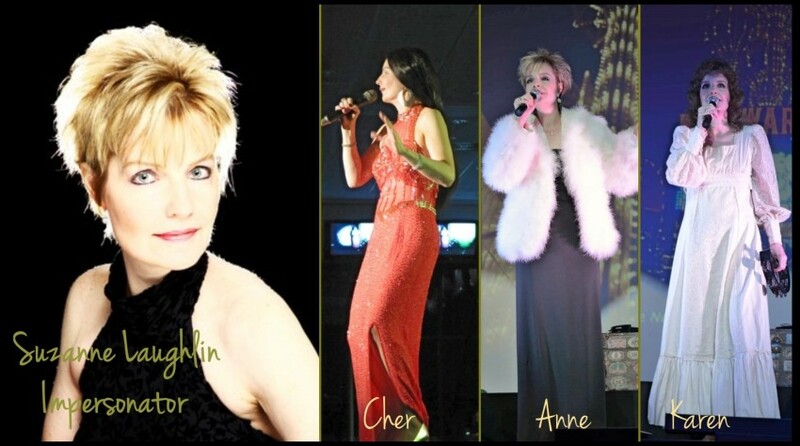 'Close To Karen' or 'Forever, Anne' shows are custom track shows that run from 45 to 75 minutes featuring the greatest hits of the unforgettable Karen Carpenter and the Canadian Snowbird, Anne Murray. Suzanne can also combine Karen and Anne into one show as well. Both shows include costumes & props. *PLEASE NOTE: The CopyKats DUO show is performed with partner, Buster Maxwell. 'The CopyKats!' - 24 Songs, 30 Voices, 7 Costume Changes in 90 Minutes! Duo show featuring Suzanne and her amazing singing partner & master impressionist, Buster Maxwell. This is an thoroughly entertaining variety show featuring outstanding impressions of June Carter & Johnny Cash, Nancy Sinatra & Sammy Davis Jr, Barbra Streisand & Neil Diamond, Sonny & Cher, Bill Clinton, Bob Dylan, Willie Nelson, Paul Anka and more! Costume changes & props. Suzanne's BIG Variety Show! Suzanne sings a variety of hits from the 50's to the present. A perfect mixture of pop, country, Motown, disco and oldies. Suitable for events needing 1 to 3 hours of entertainment. Book one of her shows today and experience a wonderfully unique & fun performance your audience won't soon forget! 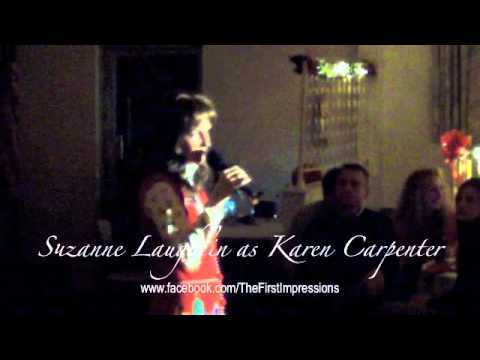 Multi-talented singer/impressionist, Suzanne Laughlin, is not only a 70's Cher impersonator, she also pays tribute to Anne Murray, Karen Carpenter and Nancy Sinatra as well. Her deep, sultry voice always leaves her audiences wanting more and that's why she can be found performing anywhere around the country. Her specialty is creating, producing and performing in impersonator/impressions/tribute/comedy/variety shows for many types of venues including casinos, corporate & private events, fairs, festivals, bus tours, theaters, halls, cruises, senior communities & resorts. She grew up loving all genres of music, so her shows include a wide variety of songs. She's been a successful tribute artist and variety singer for years and she currently has 6 different shows to offer... they're fab, fun & affordable! 'That 70's Cher Show.' This short 20 to 30 minute show is great for the surprise birthday party or anywhere you need the 70's looking Cher. Suzanne sings the diva's major hits and throws in a lot of barbs and hair swingin.' A 'spoofy' & 'groovy' hit that's fun for everyone! 'Cher & Friends Variety Show.' Suzanne begins her 45 to 70 minute performance by taking the stage in a beautiful gown donned in a gorgeous long wig. She opens with an upbeat song and then explains to the audience that she will be doing a few of her favorite singing impressions beginning with Karen Carpenter then moving onto Shania Twain, Anne Murray, Nancy Sinatra, Crystal Gayle, Tina Turner & disco queen Alicia Bridges, etc., while sprinkling in some beautiful standards from the great American songbook. Props like go-go boots, jackets, jewelry, hats and tambourines, etc., are used as she features a different character. Approximately 15 or 20 minutes before the show ends, Suzanne makes a quick WIG & earrings change right in front of the audience into Cher! She also uses a custom-made, 3 foot-high Sonny Bono puppet to bring the totally hilarious 'duo' aspect to life! 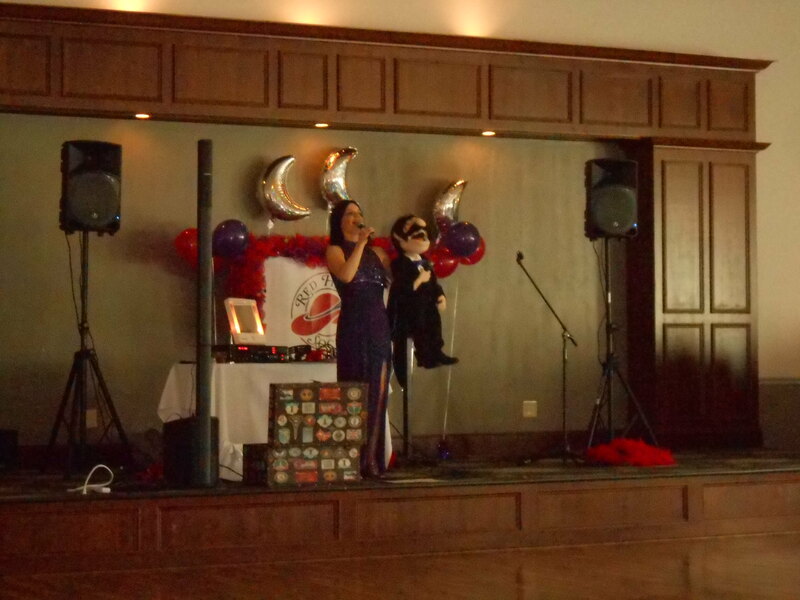 The combination of comedy, singing, audience participation & special props makes for a totally entertaining show that is perfect for private or corporate events, senior community facilities, casinos, halls, small theaters, festivals, nursing homes, country clubs and resorts. 'Forever, Anne' - custom track shows that runs from 45 to 75 minutes featuring the greatest hits of the Canadian Snowbird, Miss Anne Murray. Artist provides the sound system if the gig is within driving distance (no more than 4 hours one way) from the Pittsburgh area. Suzanne can also combine Karen and Anne into one show as well. Custom track shows including costumes & props. 'The CopyKats!' - 30 Voices, 24 Songs, 7 Costume Changes in 90 Minutes! 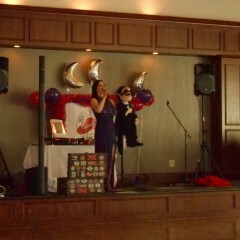 Duo show featuring Suzanne and her amazing singing partner & master impressionist, Buster Maxwell. This is an incredibly entertaining variety show featuring outstanding impressions of June Carter & Johnny Cash, Nancy Sinatra & Sammy Davis Jr, Barbra Streisand & Neil Diamond, Sonny & Cher, Bill Clinton, Bob Dylan, Willie Nelson, Paul Anka and more! Costume changes & props. Suzanne's BIG Variety Show! 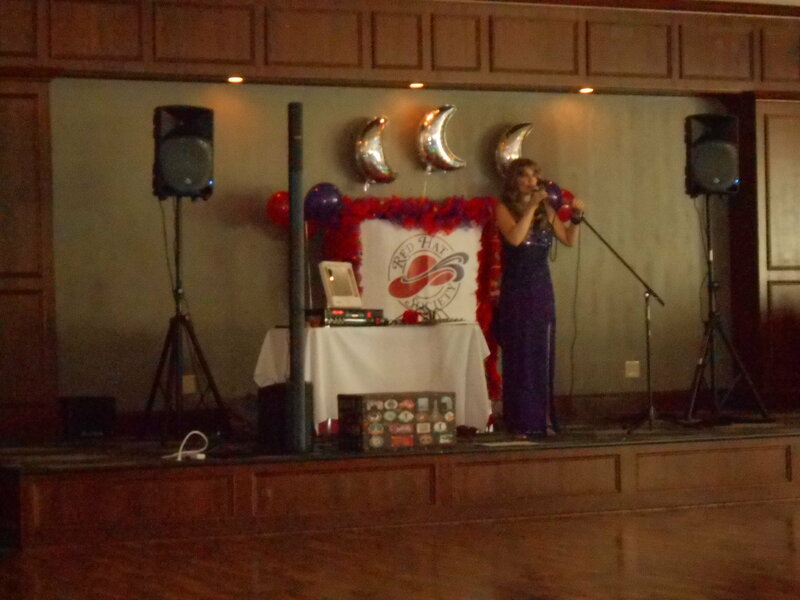 Suzanne sings a variety of hits from the 50's to the present that feature all genres including pop, country, big band, Motown, oldies and disco, etc. Suitable for events needing 1 to 3 hours of entertainment! Book her show(s) today and experience a truly wonderful & fun performance your audience won't soon forget! 1) House PA - Quality, modern system with mains & three stage Monitors, spaced as determined in soundcheck. 2) House Soundtech to set up, mix and run system at soundcheck and shows. 3) Professional quality dual-deck CD player - music sequence of entire show may be run from CDs. or Mac may be used as backup player). One 6’ table and a coat hanger for gowns. Also, a large mirror if available. 2) MEAL HOSPITALITY for lunch or dinner if available. Beverages including coffee, bottled water, Diet Coke, ice and any other soft drink would be greatly appreciated. 5) LIGHTING: whatever standard house lighting is available. 6) PROJECTION/MOVIE screen, 9x12’ is requested, but not a necessity - *please advise of availability. 1) PRODUCERS may bring merchandise to sell: please advise of clearance from management on same. 2) PRODUCERS may give away a small box of candy or other gift within the show - if CLIENT would like to add another gift to this giveaway, please advise and we will be happy to include (2 tix to your upcoming shows, etc.). •PRODUCERS may videotape this performance, and herein request permission from CLIENT. •NO other professional audio or video recording of this show may occur without written permission from PRODUCERS. 1) Additional Expenses: Any additional CLIENT-requested expenses or materials that arise during preproduction shall be discussed and approved by both parties before purchase or rental. 2) Verification of details: PLEASE DOUBLE-CHECK DATES, TIMES & TECHNICAL NEEDS, and please contact us as soon as possible for clarification or any requested changes or additions. Thank you for considering me for your entertainment needs! Karen Carpenter, Sonny & Cher, Anne Murray, Peggy Lee, The Judds, The Rat Pack, The Bee Gees, The Captain & Tennille, etc. Was an avid fan of Motown, Big Band, the disco era, 70's & 80's country music and hit music of the 50's, 60's, 70's & 80's. Suzanne uses her own sound system unless house sound is provided. Will discuss.